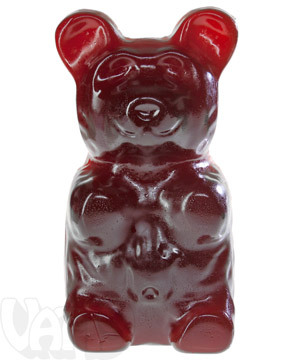 The World's Largest Gummy Bear: A 5 pound gummi bear! 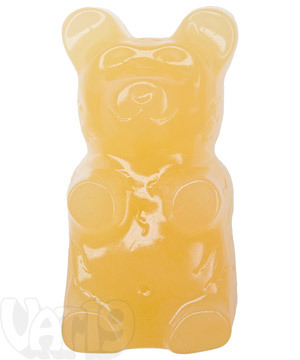 The World's Largest Gummy Bear is the lion of the candy world. There is no candy more magnificent or more powerful. 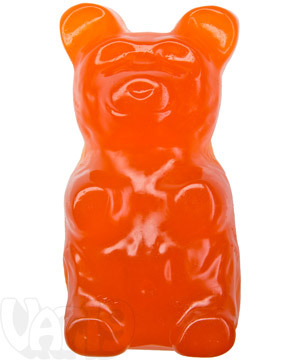 This five-pound beast is the equivalent of 1,400 regular sized gummy bears and packs a whopping 6,120 calories. Its monstrous size is only matched by its enormous taste. 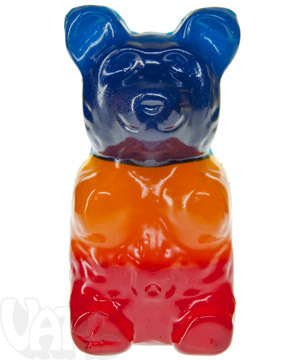 The World's Largest Gummy Bear tastes just as delicious as its pint-sized counterpart. Available in many flavors: blue raspberry, red cherry, green apple, orange, pineapple, bubblegum, grape, cherry cola, and two three-tone bears. Hand-made in the USA. Dimensions: 9.5" x 5.5" x 3.5"
These are real. They are awesome. You can buy them. 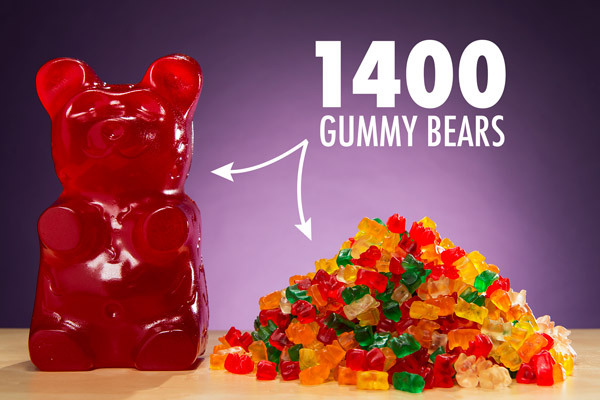 It's the equivalent of 1,400 regular sized gummy bears. It weighs approximately 5 LBS! 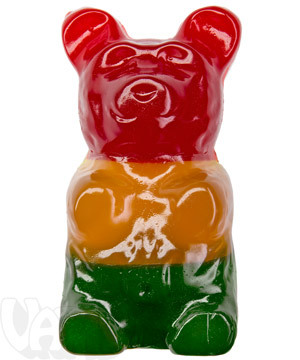 There are 51 servings per World's Largest Gummy Bear. 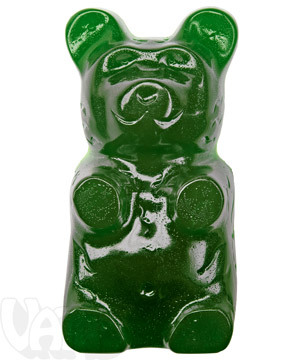 The World's Largest Gummy Bear is the equivalent of 1,400 regular sized gummy bears. 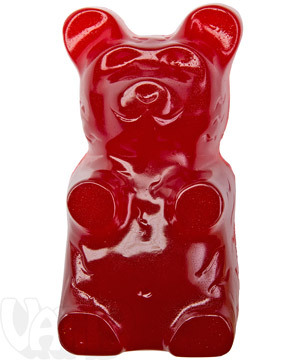 Nutritionally, the World's Largest Gummy Bear isn't on par with a bag of trail mix. 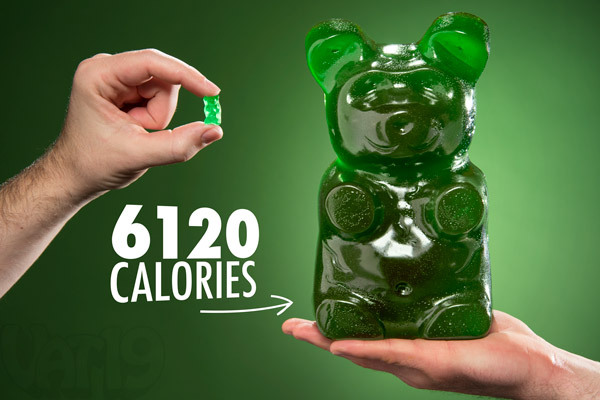 This gummy "snack" may take a few weeks (and the help of a few friends) to polish off because there are fifty-one 120-calorie servings in each bear. 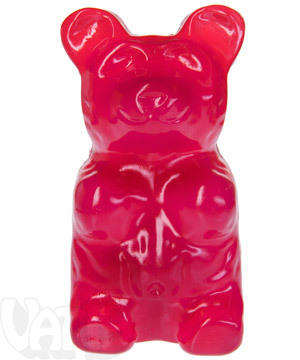 If stored in a sealed bag or container between uses, the World's Largest Gummy Bear will last up to a year. Just make sure to keep it away from extreme heat and sunlight so it doesn't melt. 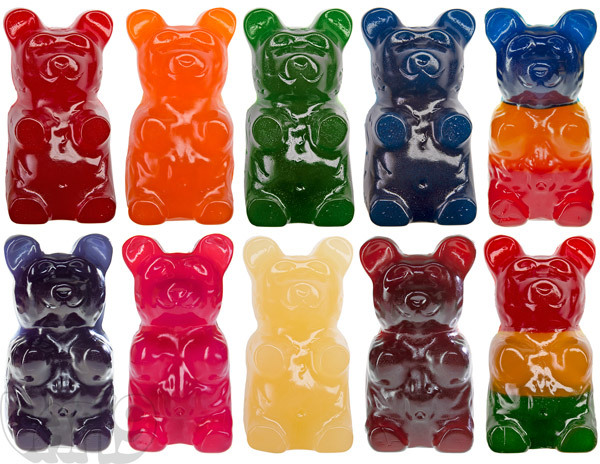 Each World's Largest Gummy Bear packs a whopping 6,120 calories. Yowzers! Many methods of consumption. All are delicious. 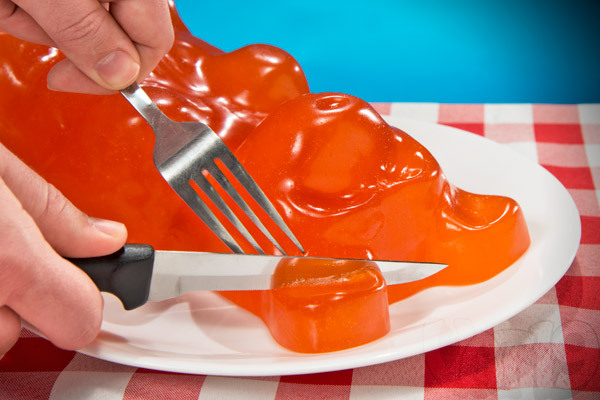 We know what you're thinking: "How am I supposed to eat this delicious creature?" Depending on your culinary style, you can either use a knife and fork or just dig in with your hands. The bite, tear, and chew method is quite an effective (albeit messy) consumption technique. For the more refined, it is perfectly acceptable to portion out your snacks with a knife and fork. 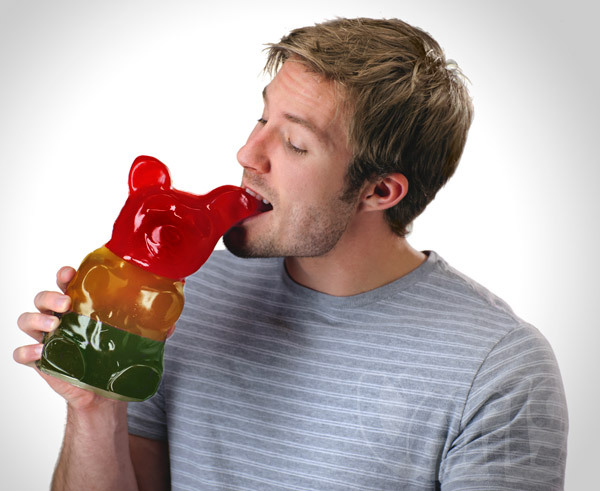 The World's Largest Gummy Bear is not intended for one man to eat in one sitting (unless that one man happens to be Michael Phelps). We suggest you bust it out at a party or gnaw away at it for a few months (it will last up to a year!). If eaten in appropriate amounts, the WLGB probably won't kill you :). Ingredients: Corn syrup, sugar, gelatin (pork source), sorbitol, citric acid, natural and artificial flavors, vegetable oil, carnuba wax, canola oil, lecithin from soybeans, water, rosemary extract. Contains soy. Can't handle this much gummy? Try our Giant Gummy Bear on a Stick. It's a mere 1/2 pound. And it comes on a stick! Available in many delicious flavors.